What would happen if the United States abolished the death penalty and emptied its Death Rows? If killers were released from prison? What would they do with their second chance to live? Would they kill again? Back From The Dead is the story of 589 former death row inmates who, through a lottery of fate, were given a second chance at life in 1972 when the death penalty was abolished; it returned to the United States four years later. During the years she represented Walter Williams on Texas’ Death Row, Cheever always wondered what would happen if his death sentence was reversed and he was eventually released from prison. Would he have killed again? Two years after Williams’ execution, Cheever was determined to find the answer. Leaving her young family and comfortable life in suburbia, she traveled across the U.S. and into the lives and homes of former Death Row inmates, armed only with a tape recorder, notepad, a cell phone that didn’t always work, and a lot of faith. In Back from the Dead , Cheever describes her own journey and reveals these tales of second chances: of tragedy and failure, racism and injustice, and redemption and rehabilitation. Visit www.backfromthedeadusa.com to find out more. Back From the Dead is an excellent choice for your Book Reading Group or School Group. On the website www.backfromthedeadusa.com there are questions for group discussion, as well as an 'interview with the Author'. Joan Cheever will chat by speakerphone with any group that chooses Back From the Dead. Now you have the chance to ask your questions directly to the author. Why did Joan Cheever write this book? What was she looking for? Did she find it? How did she research Back From the Dead? What difficulties did she encounter? What was it like, interviewing and meeting former Death Row inmates? How did she leave her little children to do this? What was she feeling while on the road with The Class of '72? What was the most surprising thing she learned in writing about the men whose return address had once been: Death Row USA. A chat with the author is FREE – just get a group of readers together and make sure you have a speakerphone and Joan Cheever will do the rest! · You'll be asked to provide a choice of dates and times. The more dates you can provide, the easier it will be to schedule a chat. The time you request should be 30 minutes to an hour after your group begins meeting so your group has some time to settle in first. · Leave a comment to let Joan know how you found out about the book and why you chose it for your group. Also, tell Joan a little bit about your book group – what other books you’ve been reading, the range of ages in the group, where you are from etc. · Chats are not limited only to readers of Back From the Dead in the United States. As long as it can be scheduled within the hours listed above, Joan welcomes a conversation with readers across the globe. · And if a chat is not possible, Joan is working on setting up an online 'Instant Message' discussion so that readers can ask the questions they have AND get an immediate response online during your meeting! Once you’ve made your request, we will be back in touch with you, usually within a few days. Together we will determine the date and time for the chat. You will need access to a speaker telephone. Joan recommends giving it a trial run beforehand by having someone in your group dial in to that phone from outside. Make sure that you can hear her clearly—and that she can hear you from a good distance away. Plan for Joan to call you 30 minutes to an hour after your group gets together. At that point you will have begun your discussion about Back From the Dead and Joan will be able to answer the questions from the author’s perspective! At the appointed time, Joan will call in and for the next 30 - 45 minutes, you can put your feet up, relax and find out more about Back From the Dead, the author, her research and any news updates. As a young lawyer Joan Cheever served as co-counsel for Walter Williams, an inmate on Texas’ Death Row. For nine years she attempted to stave off his execution until, in October 1994, his chances finally ran out. At his request Joan stood beside him at his execution; it was an experience that changed the course of her life. In the months following Walter’s execution Joan continued to ask herself how events might have been different: would Walter have committed the crime if he’d had better opportunities in life or a more supportive family? And how would he have lived if he had been granted a second chance at life? The only people who could help to answer these gnawing questions were other convicted murderers. In 1972, the US Supreme Court abolished the death penalty: a ruling that stayed in place until 1976, granting hundreds of convicted killers a second chance at life. Joan embarked on an exhaustive and dangerous search to track down and interview these murderers, most of whom didn’t want to be found. Many had built entirely new lives and had become valued members of their communities; a very small number had killed again. Joan Cheever interviewed the murderers to find out if they had managed to rebuild their lives; she also spoke with the families of victims. The personal stories that she tells here contribute to a ground-breaking exploration of the issues at the very heart of the capital punishment debate. Back From The Dead is the story of two hundred former inmates of death row who, through a lottery of fate, were given a second chance at life. Many have not been so lucky. After representing Walter Whitman, a convicted murderer and Texan Death Row inmate, as a young lawyer, Joan Cheever wanted to discover whether he could have been rehabilitated into the community? Had his execution protected society or was it simple revenge? To find the answers she left her white-picket world and young family and went in search of former residents of Death Row. Her journey led her across the United States, into the lives of these killers. She heard their stories at first hand, sometimes in seedy motels and sometimes at danger to herself. In Back from the Dead Joan reveals these tales of tragedy and failure, of racism and injustice, but also in some cases of triumph and redemption. 9. 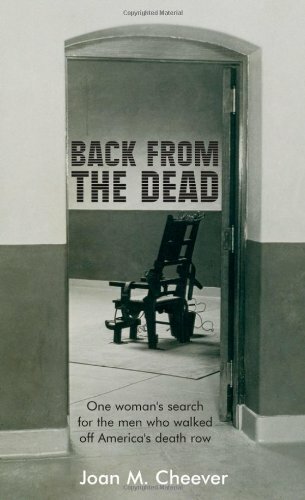 Back from the Dead: One Woman's Search for the Men Who Walked off America's Death Row Cheever, Joan M.